On Oct. 5, 1970, Marvin Grosswirth, chairman of the Public Relations Committee, proposed that a “Mensan of the Year” award be presented annually to the Mensan who had contributed most significantly to the betterment of Mensa. The motion passed, and Arthur Merrill was appointed as this newly-formed Award Committee’s first chairman. Since that time, American Mensa and the Mensa Education and Research Foundation have developed a number of award programs to recognize members, Local Groups and scholarship recipients. We have Life Membership awards, Group of the Year, the Copper Black Award for Creativity and many others. 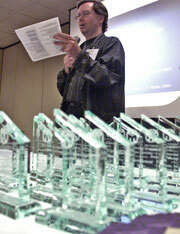 Today, American Mensa has a number of awards that recognize hard work, knowledge and creativity. From community service to esoteric cultural knowledge, from writing groundbreaking essays to creating a chapter home page — awards are presented annually recognizing those individuals and groups who shine brighter in their efforts.